Most chefs guard closely the secret of their basic curry sauce, but in this book, Kris Dhillon reveals all, and offers you the opportunity to reproduce that elusive taste, in your own kitchen. Learn how to create chicken, lamb, fish and vegetable curries of mouth-watering quality as well as a wide variety of other Indian dishes. This is the curry book with a difference! It gives the secret of Indian Restaurant Cooking – not the traditional cuisine practised by Indians at home – but the particularly interesting and distinctive variety that is served in Indian restaurants all over the world. Kris Dhillon writes with the authority of an accomplished Indian restaurateur, with many years experience and thousands of satisfied customers. Most chefs guard closely the secret of their basic curry sauce, but in this book Kris Dhillon reveals all, and offers you the opportunity to reproduce that elusive taste, in your own kitchen. Learn how to create chicken, lamb, fish and vegetable curries of mouth-watering quality as well as a wide variety of other Indian dishes. Chicken Tikka , Seekh Kebabs , Onion Salad , Chicken Balti , Lamb Biryani , they're all here ! I tried a number of other books which allow far quicker preparation. The curry sauce takes a while to prepare and I initially thought that it was a complete pain …until I tried the finished curry. A lamb madras that was worthy of many restaurants. The author is not kidding when he says make restaurant curries at home, I was totally converted and now have a stock of the curry sauce in the freezer. 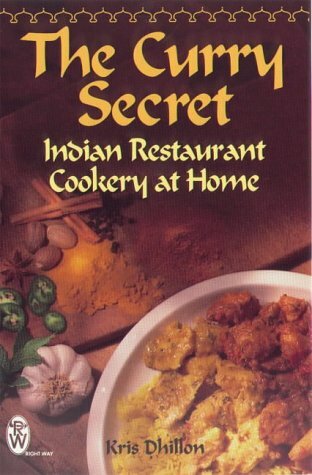 This book is a must if you want great curries at home and I cannot recommend it highly enough. Forgot these hardbacked, glossy books this is the one to buy. As a born and bred Brummie, restaurant curry has been a mainstay of my regular diet. For years and years, I've struggled to recreate the delights of the restaurant curry, always with little success - somehow they always tasted a bit too 'english'. Then I found this book. It is absolutely fantastic - an real must if you want to make a really good curry. As other reviewers have pointed out, the basic curry sauce takes some time to prepare but if, like me, you enjoy pottering in the kitchen with a bottle or two of wine and some good cd's, you'll enjoy doing it with this book. I would suggest it is critical that you find a local Indian/Pakistani grocer where you can buy traditional ingredients for half the price you will find them for in the 'ethnic' section of the supermarket!! Also, don't be shy about using food colourings - they just seem to give it that final edge. Thank you Kris Dhillon for an amazing book I wouldn't be without.